Very patriotic - I love the wavy bars!!! Nice that they will put it all together for you!! Enjoy your holiday weekend! 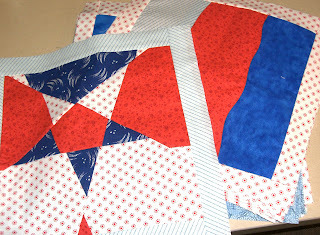 Nice blocks and I'm sure the completed quilt will mean a lot to the person who is lucky enough to get it. Have a relaxing weekend. They look so pretty, I bet they look awesome all done up into a quilt. Maybe you will get to see it finished on their page when they present it to a deserving soldier! Love your blocks...I sent them a couple, too. Wouldn't it be fun to be able to follow your blocks to the soldier who received them? :) Thanks for participating.